Bob Livingston is a singer/songwriter and storyteller from Austin, Texas. 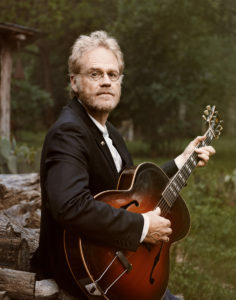 Livingston’s creative legacy branches further than his work as a founding member of the Lost Gonzo Band, which backed Jerry Jeff Walker and Michael Martin Murphey. As he puts it on his forthcoming ninth solo album, Up the Flatland Stairs, Livingston hasn’t unpacked in 40 years. Instead, he has toured the world with songs tucked tightly in his mind’s rucksack. But, as with its predecessor Gypsy Alibi — which was named Album of the Year by the Texas Music Awards in 2011 — each facet of Up the Flatland Stairs glimmers as an authentic dimension of Livingston’s singular aesthetic. He’s cerebral and a little bit feral, evoking the kind of characters you’d spot shuffling through the Louvre in snakeskin boots or reciting lines from Kafka to a redbone coonhound. Livingston was inducted into the “Texas Music Legends Hall of Fame” in 2016.